In its first 100 days the 3rd House of the Autonomous Bougainville Government has moved to implement a number of important initiatives to strengthen its public service machinery to effectively deliver goods and services to the people of Bougainville and prepare the people for the Referendum. ABG President Grand Chief Dr John Momis in presenting his ministerial address today said that his department, the Department of the President and Bougainville Executive Council as the premier and lead department of the government has the important responsibility to coordinate the formulation of Government policies. “My department is responsible for developing appropriated legislative framework and implementing government policies to ensure the smooth delivery of goods and services to the people,” President Momis said. The government has already made permanent appointments to the Departments of Police, CIS and Law and Justice, Department of Community Development, Department of Personnel Management and Administrative Services, Department of Health, Department of Technical Services, Department of Community Government and the Department of Primary Industry. The Senior Appointment’s Committee was not able to make permanent appointments to the remaining four departments including the newly created Department of Referendum, Peace and Reconciliation due to the lack of suitable candidates. President Momis also mentioned the Planning and Budgeting Framework of the ABG noting that the Bougainville Peace Agreement is the overarching roadmap that will guide Bougainville’s political and development policies. President Momis revealed that the approved development priority sectors together with percentage splits are as follows, a) Economic Development (28%), b) Social Sector (23%), c) Planning and Administration (13%), d) Law and Order (8%), e) Infrastructure (18%), f) Rural Development (10%). The President also formally announced the date of the Joint Supervisory Board Meeting as the 20th of October in Rabaul, East New Britan Province. He said discussion on Bougainville’s Referendum will be the main issue of the coming JSB and to address the issues related to it. Other proposed issues to be discussed at the JSB will the slow pace of the draw down of powers, tax revenue collections, the Special Intervention Fund as it draws to a close and other high impact development projects for Bougainville. The first hundred days of the present government looks optimistic in its drive to foster better and creative measures of development for its people in the coming years as it prepares for the Referendum. The Bougainville Senior Appointments Committee (SAC) contracted an executive recruitment firm to assist the committee and to make the departmental head appointments. Air Energy was appointed to do the recruitment and was tasked to manage an open, transparent and merit-based recruitment process for the 14 departmental head positions, the two deputies in the Department of President and BEC and the urgent appointment of an Electoral Commissioner. 1. In the week of Monday 8 September the start of two weeks of advertising for all positions. 2. Friday 26 September applications for these four positions to be closed. 3. Friday 10 October the shortlist were to be prepared in consultation with Mr John Kali. 4. In the week of 20th October interviews were conducted. 5. In the week of 3 November, or earlier if the interviews and paperwork was completed, the Bougainville Senior Appointments Committee were to meet to consider independent panel’s recommendations and to make appointments. 1. Friday 12 September all positions descriptions for the remaining 11 departments and two Deputy Chief Secretary positions were to be completed. 2. The week of Monday 15 September the start of two weeks of advertising for all positions. 3. Friday 3 October applications closed. 4. During October the recruitment firm was to carry out referee and qualification checks and prepare the short lists for all positions. 5. Interviews to take place November and early December. All enquiries about the recruitment process to be directed to the contracted recruitment firm. This was important to ensure all applicants were treated fairly and evenly. 6. The Administration to make announcements on the progress of the recruitment process. The restructure of the public service was important for Bougainville, it was even more important because it amplified on the power of self-governance and autonomy as reflected on the Public Servants Act 2014. It only strengthened the Bougainville Peace Agreement, and the spirit of being an Autonomous Bougainville Government. The Autonomous Bougainville Government has started implementing the Bougainville Public Service (Management and Administration) Act 2014 which will see the re-structuring of all departments in order to meet Cabinet’s service delivery and economic growth priorities. Minister for Public Service Hon Raymond Masono reiterated again on the Public Service Act and the importance of it. On Monday 28th September, four Departmental Heads were sworn in as permanent secretaries. Masono congratulated the four secretaries that were the first to be declared. He reiterated that, the positions were based on ‘Acting’ till the Public Service Act came to pass and changes were made such as the appointments of the Departmental heads. Mr Bernard Tzilu- Secretary, Department of Technical Service and Mr Kenneth Nanei- Secretary, Department of Justice & Principle Legal Advisor. The Secretaries made their oath of pledge to loyalty of service to the Autonomous Bougainville Government, the National Government and the people of Bougainville. The pledges were made in front of the Presiding Magistrate Bruce Tasikul, Chief Secretary Mr Monovi Amani, the ministers of the Departments and other candidates and public servants. Chief Secretary to the Autonomous Region of Bougainville, Monovi Amani announced that the Bougainville Senior Appointments Committee was still yet to appoint the other candidates. In a congratulatory remark to the Secretaries, Minister for Public Service, Raymond Masono exclaimed that for many years the government wanted its own public service… “This public service is now ours,” he declared. Today at the second sitting of the ABG parliament, President Hon Dr Chief John Momis stated the significant achievements that had occurred in the first one hundered days of the government. “ We are consolidating the work of governing and delivering goods and services to our people by strengthening our public service. Following the appointment of the Chief Secretary as head of the public service early this year, the Senior Appointments Committee (SAC) of which I am Chairman has confirmed ten permanent heads of departments for ten (10) departments,” Momis said. 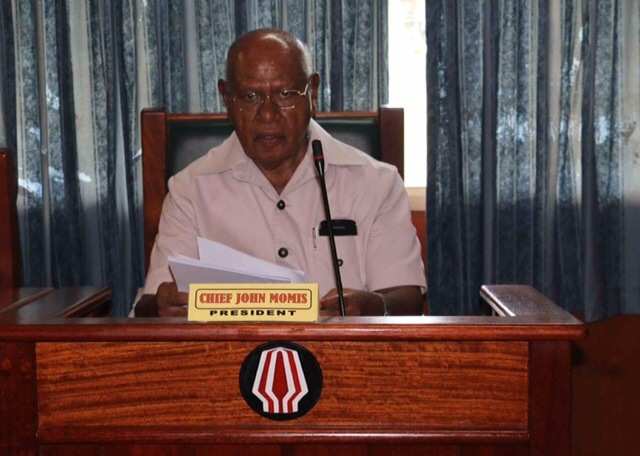 President Momis said that the SAC, made permanent appointments to the Departments of Police, CIS & Law and Justice, Departments of Community Development, Department of Health, Department of Technical Services, Department of Community Government and the Department of Primary Industry. President Momis said that he was confident about the appointments made. “I am confident that the caliber of people appointed to the permanent positions possess the knowledge, experience and qualifications required to ensure that the Departments carry out their mandated responsibilities and functions effectively and efficiently.